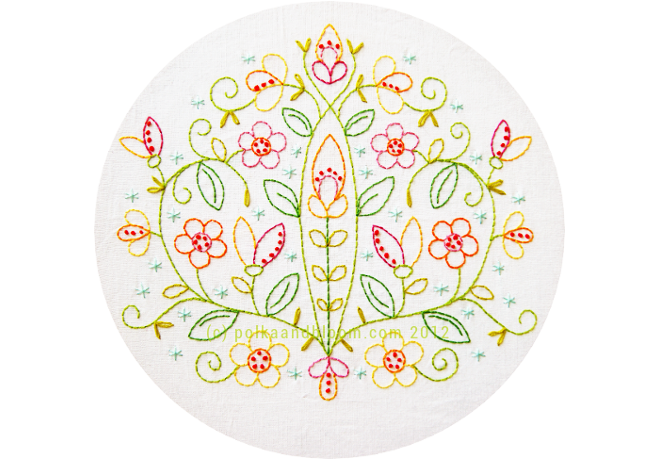 May Flowers is an original pattern from Polka & Bloom. This will look lovely on a pillow case, simple and pretty. The pattern will also be a fun embellishment on a tote bag. Or make it in a single colour on a solid coloured background for a table cloth! Once payment is completed you will receive an email with a link to to download the pattern. The images in the actual pattern are clear and do not have the copyright line in them. The pattern and images are copyright Carina Envoldsen-Harris 2012 and are for personal use only. You may not sell the pattern or any items using the pattern.